In political terms, these last few weeks have been depressing. First, we were subjected to the electoral version of Who Wants To Be A Millionaire? (aka the Irish presidency ), while thousands of Irish families remain homeless, with no sign of a publicly financed house building programme. If you took refuge in Britain’s TV channels you were subjected to everyone wearing the jingoistic poppy – excepting two soccer players, Derry’s James McClean and Serbian Nemanja Matic. And last weekend both these dubious political campaigns peaked: The Irish establishment congregating to crown Michael D as Uachtarán na hÉireann, and all the hypocritical commemorations to mark the ending of the imperialist WWI. French president Emmanuel Macron stole the show at the latter event, earning himself the title Napoleon, when he called for the formation of a European army to do battle with all the EU’s enemies. What happened to the resolve “Never Again War”? Another would-be Napoleon is EU president Jean Claude Juncker. In 2016 he called for an EU “security union with the end goal of establishing a European army”. 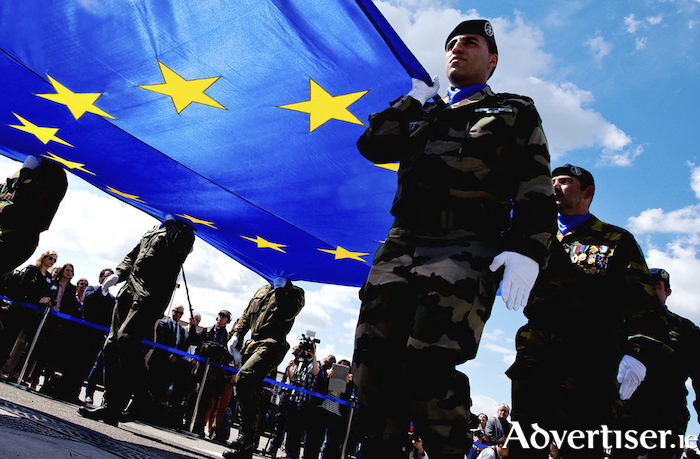 It was therefore a relief to see huge billboards around Galway asking the question: Are we heading towards an EU army? MEP Luke Ming Flanagan was holding a public meeting to highlight the dangers of Irish people fighting in foreign lands for the EU super-state. Last December, PESCO – Permanent European Security/military Cooperation - was rushed through the Dáil by Fine Gael and Fianna Fail to become Government policy. In a nutshell, PESCO, and the recently-proposed Defence Union, involves a permanent EU army established by 2020 through the harmonisation and standardisation of European armed forces, all leading to the EU’s ability to launch military missions, (aka “autonomous action” ) separate from NATO, as part of the EU’s global strategy to become a 'global actor'. This will come at a serious financial cost. PESCO foresees us spending two per cent of our GDP on all things military. Currently our military expenditure in real terms is around €960 million a year. The Government claims that is equivalent to 0.6 per cent of GDP; the EU (Eurostat ) determined it is 0.3 per cent of GDP. So, PESCO will increase our military expenditure to an unbelievable €6 billion a year, or half the total health budget. The cost did not worry Leo Varadkar when he lined out with other EU leaders on December 14 2017, flanked by soldiers in combat dress, to inaugurate the PESCO pact, which EU Council president Donald Tusk said was “bad news for our enemies” – clearly anticipating combat operations. Bad news too for the sick lying on hospital trolleys in Ireland. Bad news for families and single people seeking a roof over their heads they can call home. However, when it comes to standing shoulder to shoulder in military style with the EU bigwigs Fine Gael and Fianna Fáil have no difficulty, nor do the Government 'independents'. Labour and the Greens oppose PESCO, but ultimately it is a product of the Lisbon Treaty, which they were equally culpable in forcing through in a second time around. And although Uachtarán Higgins voiced concern about PESCO during the recent election, he campaigned in favour of the Lisbon Treaty in both referenda. As the Labour Party’s Foreign Affairs spokesperson, he understood its implications. As the water charges showed, only mobilising large sections of the population will stop PESCO. That means a serious campaign explaining that PESCO means squandering €6 billion per year and inevitably losing young gullible Irish to the EU empire wars. The poppy - why the fuss? To cover up such war disasters the establishment may produce a symbol to 'honour' the dead 'heroes' and justify more killing. The poppy emblem is a case in point. It stems from the pro-war poem 'In Flanders Fields'. Written by a lieutenant general in 1915 it urges the reader to “Take up our quarrel with the foe”. This is what the poppy represents: justifying conflict where foreign empires clashed in search of colonial territory and ordinary folk becoming cannon fodder – including Insider’s grand-uncle, decapitated at the Somme. Back then the socialist republican George Gilmore highlighted how in Protestant Portadown recruiting posters called on working folk to oppose 'Catholic Austria', while in Catholic Ireland they sought our ancestors to fight to save little 'Catholic Belgium'. Ignored was the fact that Belgium’s King Leopold personally “owned” and brutally ruled the resource rich Congo – as documented by Roger Casement. One of the spurious reasons given in the twenty-six counties for sympathising with the wearing of the poppy is the alleged discrimination of ex-servicemen on their return to Ireland in 1918. The historian Paul Taylor has written extensively on this and states there is little to indicate they were marginalised. He quotes General Mahon, a senior member of the British Legion, who described such claims in 1928 as “A lot of humbug”. Conor McNamara writing in War and Revolution in the West of Ireland 1913 – 1922 notes that in 1921, when Sinn Féin was a dominant force on Galway’s Urban Council, Claddagh fishermen, whose equipment was in need of repair after their return from the war (the Claddagh had a high rate of service within the Britihs Royal Navy ), were not discriminated against and received grant aid. In contrast, an acquaintance of old Galwegian stock, related how after his grandfather was killed while serving in the British navy during WWI. His family was evicted from their “servicemen’s house” in the Claddagh by the British. There was conflict between ex-servicemen and republicans, but numerous ex-servicemen joined the IRA. Tom Barry is just one of many. And let us remember the Connaught Rangers’ Private James Daly – a man with strong Galway links - who was executed in India in 1920 for leading a mutiny in protest over the Black and Tan terror at home. Later that year, Galway’s Ex-Servicemen Association held their annual Armistice parade led by British Dragoons. At UCG they forced 70 students and professors to recite “God Save the Queen” and publicly flogged three students for refusing to remove their caps (see Conor McNamara’s book ). Can Sharon Nolan become the Soc Dem's first Galway councillor? Page generated in 0.0975 seconds.